But the project subsequently stalled. Rows between officials and preservationists broke out amid concerns that the expansion would not be completed by the scheduled date of 2018. Following a meeting of Moscow's architectural board earlier this week, the city's chief architect, Sergei Kuznetsov, told local reporters that he was concerned by Lord Foster's distance from the project. "Either Norman Foster must himself work on the project and defend it face-to-face, personally... or he must turn down this project," Mr Kuznetsov told journalists, reports The Art Newspaper. "If Sir Foster, for one reason or another, refuses to participate further in the work, then, most likely, a competition will be held to choose another team, possibly of Western architects," he added. However, the architecture practice said it withdrew from the expansion, in a letter dated 5 June this year. "Foster + Partners formally resigned from the Pushkin Museum project and stipulated that their name could not be used in conjunction with the project, as confirmed in a letter from Lord Foster to the director of the museum on 5 June 2013," the firm said, in a statement. "Foster + Partners took this action because the museum, for the last three years, has not involved us in the development of the project, which was being carried out by others. This was despite numerous attempts by the practice to continue working with the museum." In July, Irina Antonova - a driving force to secure Lord Foster's involvement in the project - quit the position of the director at the Pushkin Museum, having led the museum for more than 52 years. 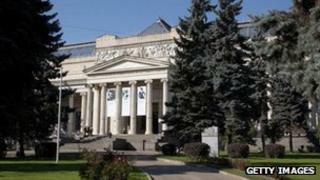 The museum, which celebrated its 100th anniversary last year, frequently hosts major international exhibitions. It is currently hosting a major Pre-Raphaelite retrospective, first held at London's Tate Britain last year.